The Halkidiki Peninsula drops three long fingers into the Aegean, all lushly forested and lined with white sandy coves. Kassandra is the peninsula with the lively infrastructure, it's not busy, but this is where you'll find the most glamorous resorts and the villages with the best restaurants and bars and many of the best places to stay in Halkidiki. Sithonia has the most beautiful of the white, sandy beaches and the best camping. Athos is famed for the ancient Mount Athos monastic community. It still gets busy in the summer though and popular with Greeks too, so book ahead - even if you're planning to stay in one of Sithonia's many campsites or self-catering apartment or villa. Despite Halkidiki's proximity, and comparable beauty, to the Greek islands, this coastline region is relatively quiet in terms of visitor numbers. Up until the last few decades it's been best known by pilgrims and those searching for historic treasures, so its development has been restrained and feels largely unspoiled. Halkidiki is a great springtime destination with water temperatures in the high teens and air temperatures around 20 degrees. The countryside is lush, green and covered in wildflowers. It's also nice in September. Where to stay - which area/resort? Most of Halkidiki's beach resorts are on the east coast of Kassandra with Sani being the largest centre with the best nightlife and Skala Fourkas a close second. As well as the most beautiful beaches, sleepy Sithonia also has the oldest mosaics ever found in Greece in the excavation of Olynthos. Sithonia also has some lovely old villages. Halkidiki's rugged interior is also a fascinating landscape to explore if you like walking or hiking. Take a boat trip from the tip of the Sithonia peninsula towards Mount Athos - the views are amazing. You can see the rows of Byzantine cliffside monasteries above the water and the sea life below. You can't visit without a permit, which must be applied for six months in advance. Women can't visit at all as there are still about 1,800 monks living here today. If you fancy unwinding from all the sightseeing then you can also visit the thermal baths at Agia Paraskevi. 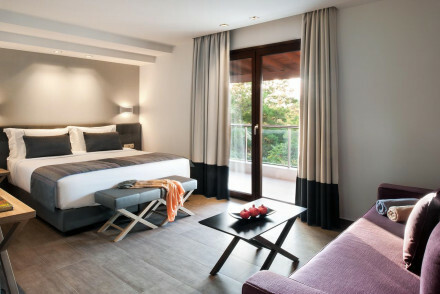 Our pick of the best places to stay in Halkidiki offer something for everyone, whether you're looking for a budget guesthouse, family friendly resort or romantic luxury hideaway. 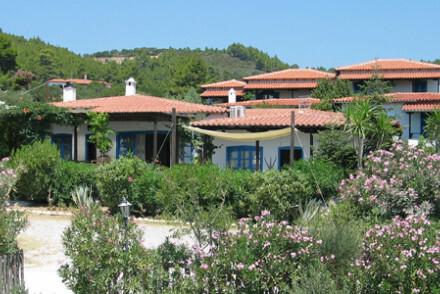 Danai Beach Resort & Villas on the Sithonia peninsula is the place to come to be pampered in quiet luxury. Villas and suites have their own private pools and the hotel has its own semi-private beach. 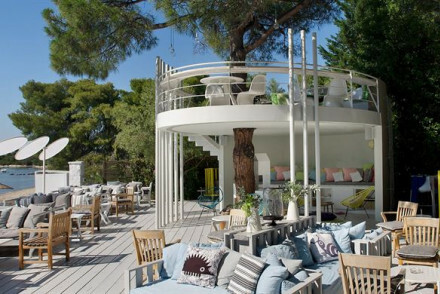 By a perfect blue lagoon on the Sithonia peninsula, the Ekies All Senses Resort has stylish, modern, designer decor and every luxury. Antigoni Beach Resort offers light and airy accommodation with splendid views, as well as all the mod cons. for a lovely beach break; a spa, an outdoor pool, private beach access and three restaurants to choose from. Ikos Olivia features tasteful contemporary rooms, a large outdoor pool and plenty of activities to keep the whole family entertained (including a Kids Club if the parents fancy a break!). 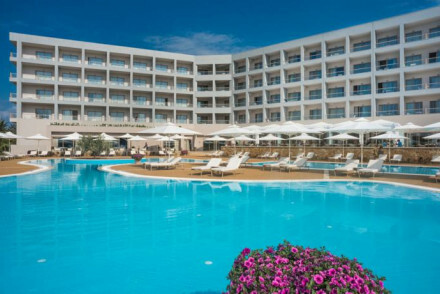 Eagles Palace Hotel & Spa is a more upmarket choice, with understatedly luxurious accommodation decorated in a typically Greek colours - some of which even feature private pools! Choose from four terrific on site restaurants and spend your days soaking up the sun on their private beach. Afitis Boutique Hotel features stylish contemporary accommodation, two restaurants, a private beach and a lovely pool - what more could you possibly need? Idyllic and impressive. The Petrino Suites are by beautiful, ancient Athitos, on the Kassandra peninsula. A beautifully designed hotel converted from a traditional style stone house, with an excellent restaurant, this complex also has family accommodation more like spacious apartments than conventional hotel rooms. Skites boasts an array of comfortable and unfussy accommodation in Ouranopolis - including apartments which are ideal for families. With a restaurant and its own pebbly beach to boot, it's a splendid all round family choice. 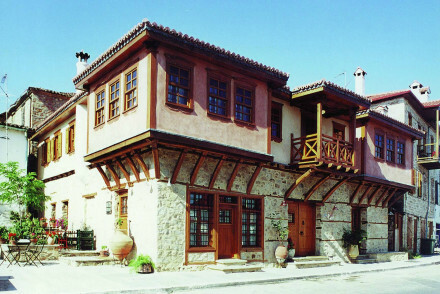 If you're looking for somewhere traditional yet unique the Alexandrou Inn is definitely one of the best places to stay in Halkidiki. From the outside it looks more like Tuscany than Greece, but this inn is full of character, and in a great location, by Arnea, a little market town. As well as ten rooms, this inn also has two family suites. Often renting a holiday villa or apartment is the best option. So for a wide range of self-catering accommodation throughout Halkidiki, we recommend you check out the properties with our online partner Booking.com. Halkidiki's nicest weather-wise in the summer, with the average daily temperature reaching 26°C in July. That said, this is peak tourist season, so if you fancy the beaches to yourself consider coming in May, September or October. International visitors can fly into Thessaloniki Airport, 80km south, before taking the bus to Halkidiki. easyJet fly direct from Gatwick to Thessaloniki, whilst Ryanair go from Stansted. 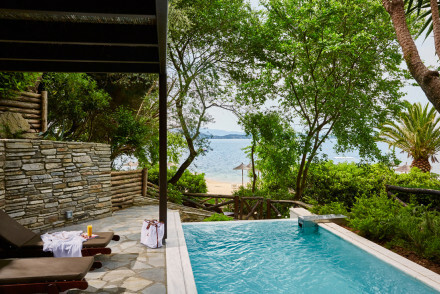 Browse through our list of all the best places to stay in Halkidiki. Widen the net to search through our recommendations in Thessaloniki, Macedonia & Thrace. Attractively designed oasis of calm in a uniquely unspoilt village, with excellent dining facilities. Apartment style rooms are situated around the pool, and lavish style gardens. 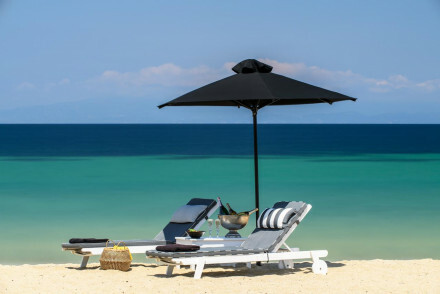 The Beaches are close by, with Halkidiki's many beach bars a short drive form the hotel. 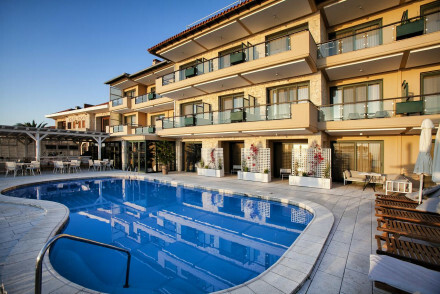 Swimming Pool - Sit back and relax by the hotel pool and soak up the Greek sunshine. A smart modern hotel, well positioned close to a number of beaches. Interiors are minimal and sleek with simple contemporary fittings, while comfortable rooms, in a subdued grey and mauve palette, are decorated with minimalist style and feature luxurious bathrooms. A great base, and good value too! 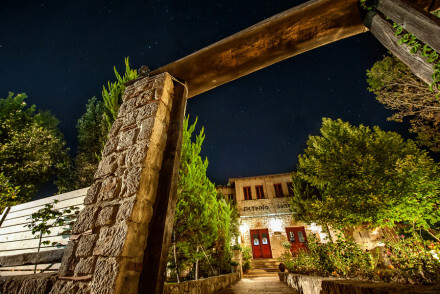 A traditional and beautifully restored traditional inn in the hinterland of undiscovered Halkidiki of rich farmland and wooded hills - good base for local exploring, full of character. Sights nearby - Being in the centre of the region it is a great place from which to explore. A modern cliffside hotel with amazing sea views from the rooms and terrace. The open-plan restaurant spills onto the pool terrace creating a fun atmosphere, while hip interiors feature sleek grey sofas and contemporary fittings. Chic, unfussy rooms have a palette of greys and stylish Scandi pieces. Pretty resort hotel with designer rooms on a lovely sandy beach. Good restaurant, lots of activities, ideal for families. A popular haven. Swimming Pool - Soak up the sunshine by the pool and enjoy the adjoining bar. Marvellous blend of simplicity and sophistication - small collection of pretty bungalow rooms and apartments with a pebbly beach, good food and a pool. A charming family-friendly boutique hotel located right on the seafront. Understated yet chic rooms, are airy and bright with crisp white linens and freshly cut flowers. The best offer sea views. Home-cooked meals are seasonal and delicious featuring traditional local dishes - a real highlight! Half Board - The price quoted is on a half board basis, and represents exceptional value for money! 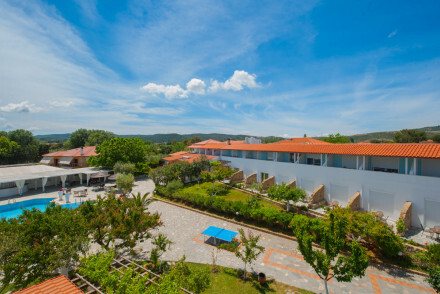 An elegant hotel situated on one of Halkidiki's finest beaches. Light, airy rooms & suites with white washed walls and stunning views, and some with private hot tub. Lovely outdoor pool, private beach & glorious spa to keep everyone occupied. Three restaurants to choose from - ideal for families. Families - A beachside property with plenty of activities to keep all entertained. Beach Life - Set on one of the most pristine white sand beaches of Halkidiki. Diving - Scuba instruction in the crystal clear waters of Sithonia Halkidiki. A 'has it all' resort with lovely gardens reaching down to the shore. The rooms are immaculate with crisp linen and large glass windows lead to great garden or sea views. Boundless activities are on offer for children and adults alike. An ideal destination for a family holiday. Families - The Kids Clubs will keep children occupied and active while parents sun themselves with a good book and a cocktail. Active Holiday - The hotel provides an endless array of activities from beach volleyball to tennis, cycling and canoeing. Diving - Beginners classes are held in the hotel pool before you head out to sea. Great walks - No better spot for a sunset stroll than along the picturesque shoreline. Full-service resort with its own beach, an abundance of activities and excellent seaside restaurants. 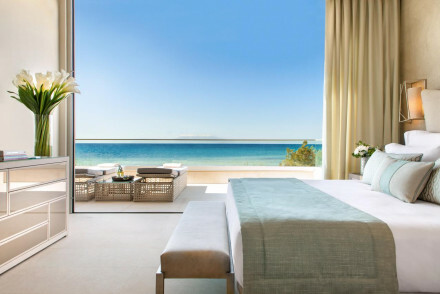 Contemporary and luxurious rooms stay in keeping with traditional Greek colours, and provide lots of space. Suites and villas with private pools are also available for that added luxury. Kids Club - Thekids are sure to be entertained with their own pool and activities program. There is also a babysitting service on site. Spa - Take a break and feel refreshed and re-energised from one of the many spa therapies on offer. 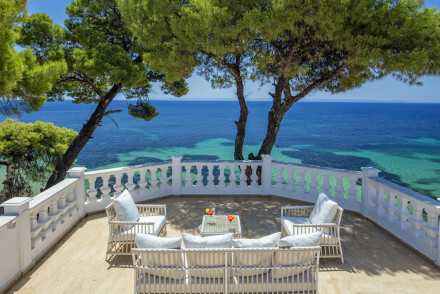 A luxury property set directly on a white sandy beach. Contemporary rooms are light and airy whilst the best rooms have private terraces. Offering two restaurants, a pristine pool and a private beach - this hotel encourages complete relaxation. Ideal for those looking for an idyllic beach holiday. Sights nearby - Take a wander around the pretty Afitos village and then head to its gorgeous beach to completely unwind. A luxury hotel with a lagoon-style pool and gorgeous beach, with a choice of quality restaurants and bars. Sleek, marble-clad interiors feature white modern furniture and quirky decor, while the fresh, bright rooms have floor-to-ceiling windows with super views. Great for both couples and families. A stunning luxury resort on the beach with a choice of pools as well as an indulgent spa and several great dining options. Sophisticated interiors have chic, simple decor and designer furniture, while the luxurious, comfy rooms in beige and pastels feature slick art and natural materials. Luxury villas and suites with private pools surrounded by lush gardens leading right to the beach which is peppered with comfy loungers. Interiors are sleek and stylish with quirky artwork. Enjoy a romantic meal under the canopy of pretty fabric gazebos while gazing at the sea. A coastal treat! Romantic, pampered, barefoot elegance in this luxurious hideaway, with private pools and a sandy beach. Excellent food. Ideal for a honeymoon or romantic break.